Eternal Gardens Memorial Park, Inc. (EGMPI) is a memorial care industry pioneer. With existing cemeteries and columbaries for the remains of cremated bodies, in Metro Manila, Eternal Gardens have been expanding to provincial areas like Luzon, Visayas and Mindanao. Eternal Gardens recently expanded their memorial park in Dagupan City in Pangasinan Province. The expansion covers an extra 22,000 square meters and offers more lawn areas, garden parklands and a plaza. Part of the new development occupies an area where previously there was a fishpond. This presented some significant challenges to Eternal Gardens, who turned to us for an appropriate solution that would also blend in with the surroundings. We had worked together with Eternal Gardens last year, when a 6m-high retaining wall collapsed in Greenhills, another memorial park owned by EGMPI. In that case, we chose a Terramesh® System retaining wall as the most appropriate solution. When it came to the Dagupan project, our engineers approached the task with an open mind. As the design had to be aesthetically pleasing, it was decided that our System Terramesh would again be the best choice. This also meant that problems with strong hydraulic pressure damaging the structure and inundating the park could be avoided as using System Terramesh allows water to drain through freely. Three sides of a rectangular parkland area were surrounded by a Mechanically-Stabilized Earth Wall, or MSE Wall. The total length of this area is 600 linear meters with a uniform height of four meters. The earthworks began in mid-2017, when the area to be contained by the MSE wall was backfilled. Our engineers remained on hand to ensure backfills were compacted to a minimum 95% of maximum dry density (MDD) according to Standard Proctor tests. 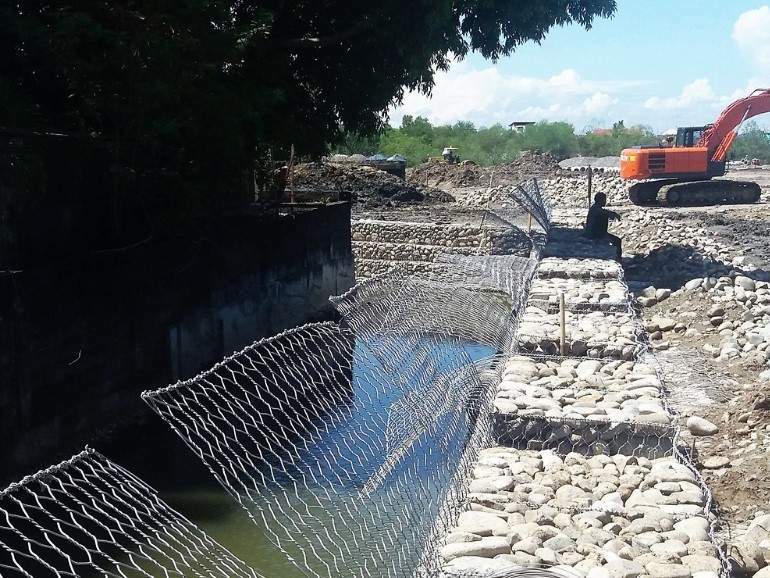 Work started on the critical first phase of the MSE wall along a 4-meter wide channel in April when the channel was lined with mattresses to prevent scouring. Once this was completed, work could progress on building the four-meter-high wall. The project has now been completed and the result blends seamlessly with the park’s tranquil environment. All our mattresses and Terramesh units are polymer coated, guaranteeing a reliable and long-term solution.